Six weeks ago, we caught a swarm that was attached to a tree close to our first hive and transferred them to a new, temporary hive. 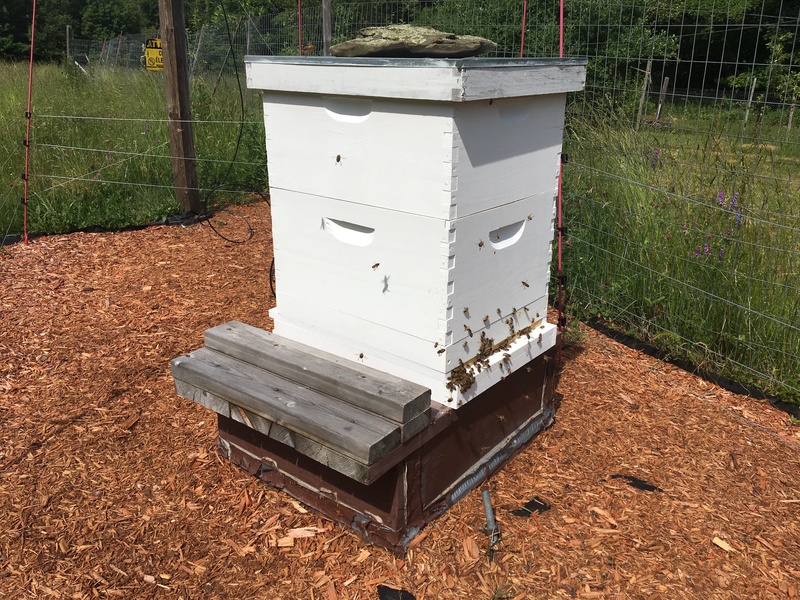 A few days later, we moved them to this new Warre hive (pictured above) – a top bar hive – that comes with viewing windows at the back, so you can see what’s going on the hive without pulling out the frames (pictured bottom). 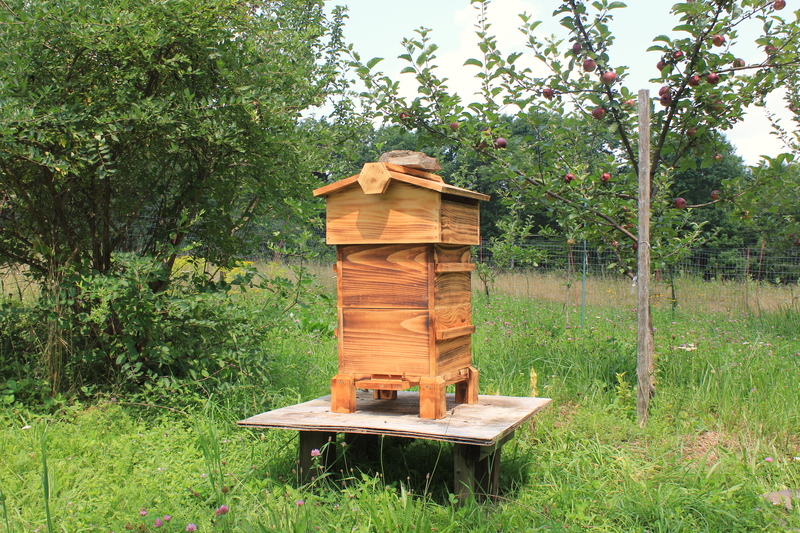 This entry was posted in Farming and tagged Beekeeping in the Catskills, Catskills, Catskills Beekeeping, Upstate Farms on September 2, 2018 by JNUrbanski. A high of 81F with billowing cloud and hazy sunshine. Garlic hanging in the shade. 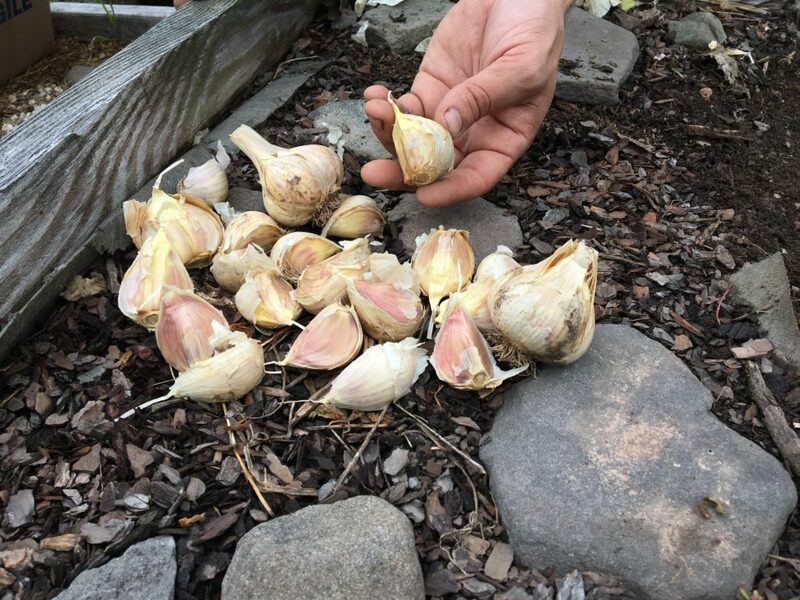 This entry was posted in Daily Catskills and tagged Catskills, Catskills Writer, Garlic Season, New York, Upstate Farms, Upstate New York on July 29, 2018 by JNUrbanski. An experienced, local beekeeper recommended that, because we have a developing, young hive, we should smear a small dollop of high-quality, raw honey on the landing pad for the bees to eat. This turned out to be another mistake and invited an attempted invasion by a group of opportunistic bees that were twice the size, just proving that beekeeping is such a personal endeavor subject to just about any possible variable. The survival of each hive is unique depending on location, weather, surrounding vegetation or position and each beekeeper should necessarily develop their own style. 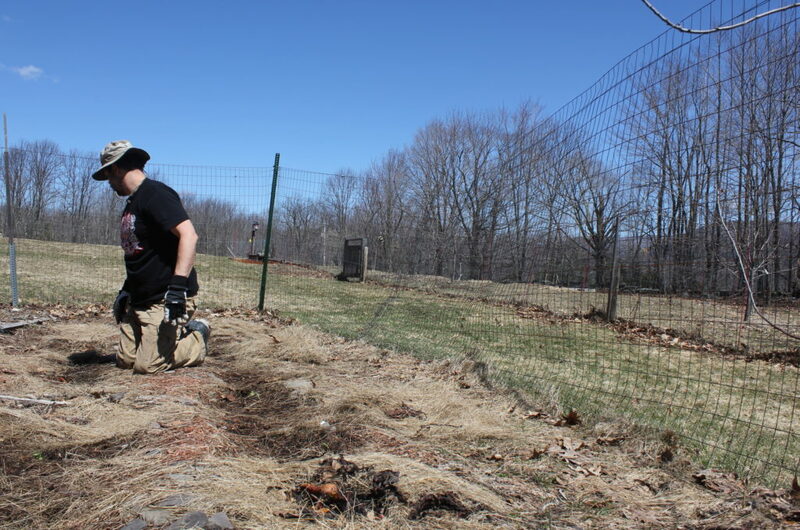 The next mistake we made was at the time of the attempted robbery in trying to adjust the entrance reducer while they were defending the hive from the attack to prevent any more robbing bees from entering, but we just got attacked ourselves. Hive robbing is a common problem during drought or hot conditions. A weak or young hive is especially vulnerable to attack when it hasn’t rained for a while, flowers are wilting or there’s little to no pollen around during that time between spring’s early blossoms like apple and the summer flowers like milkweed that’s just coming up now. Our bees successfully fought off their attackers last week, but the bandits have returned today and there’s chaos at the front of the hive this afternoon. It makes for very angry bees and we’ve had a couple of bee stings today. We’ve left them alone to defend themselves and hoping for the best. To defend the hive they are darting around the front of the hive like bullets and “bearding” around the hive entrance. Beekeeping is not easy. This entry was posted in Farming and tagged Beekeeping, Catskills Bees, Catskills Writer, Upstate Bees, Upstate Farms on June 25, 2018 by JNUrbanski. Goldenrod is the brainchild of Carver Farrell, a native of Bovina, NY, and the former owner of The Pines, a Gowanus, Brooklyn-based restaurant in which he sourced most of his ingredients in the Catskills. 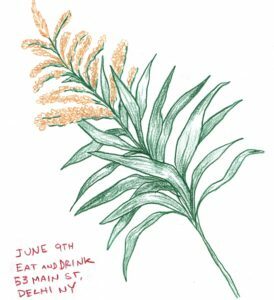 Goldenrod will continue in the tradition of The Pines, sourcing the main components of each dish exclusively in Delaware County, and offering local beers, a small wine list, and cocktails built around wild and foraged ingredients. 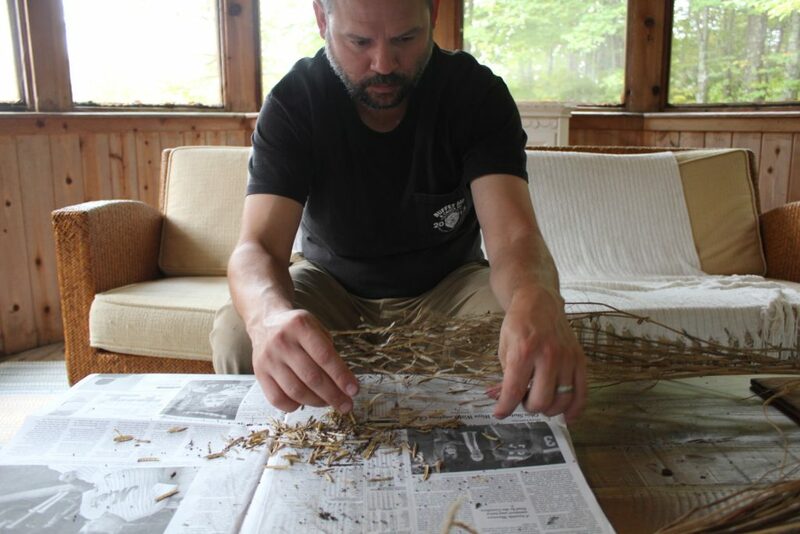 Upstate Dispatch went downstate and reviewed The Pines almost three years ago. Find that review here. Some of the dishes on that menu at the time were pork shoulder, beef burger sliders, crostini with cranberry ricotta, polenta with roasted Brussels sprouts, kale salad, pheasant soup and a plate of roasted, assorted spuds. They were on their way into winter at that time and Goldenrod’s menu will likely be more summer-themed. Nevertheless, everything at The Pines was delicious, so tasty that nobody bothered to photograph any of it and there were five of us. Sometimes, you just have to put the phone down and enjoy. Farrell will be joined by a team of three seasoned chefs that have worked at some of the finest eateries in the world, including Gramercy Tavern, Daniel, Del Posto, Prune, Le Bernadine, and Union Square Café. The menu will change nightly based on the freshest ingredients available on any given day. 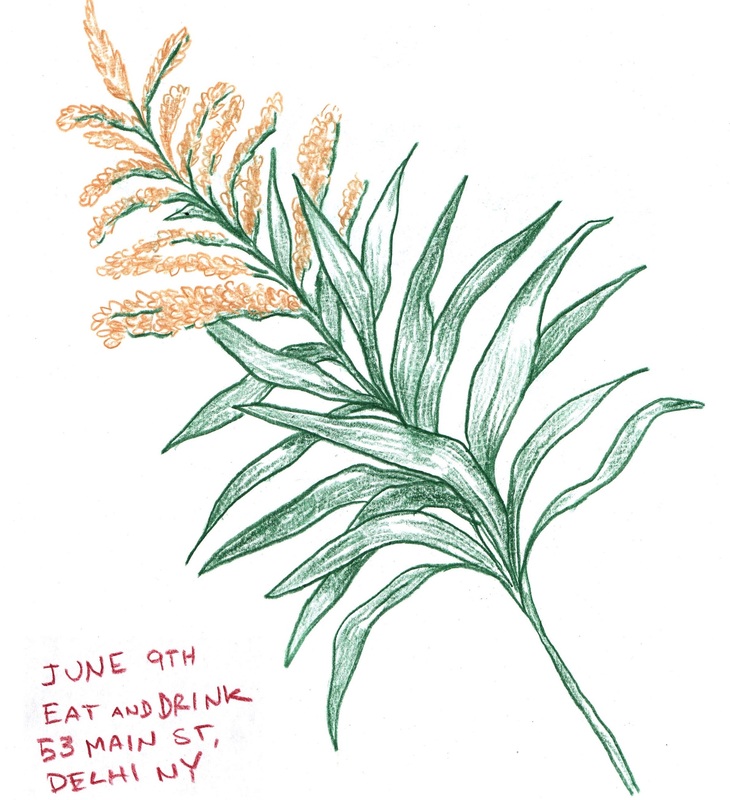 Goldenrod will open on June 9th. Dinner is available Thursdays through Sundays through Fall 2018 with a bar menu available as well. 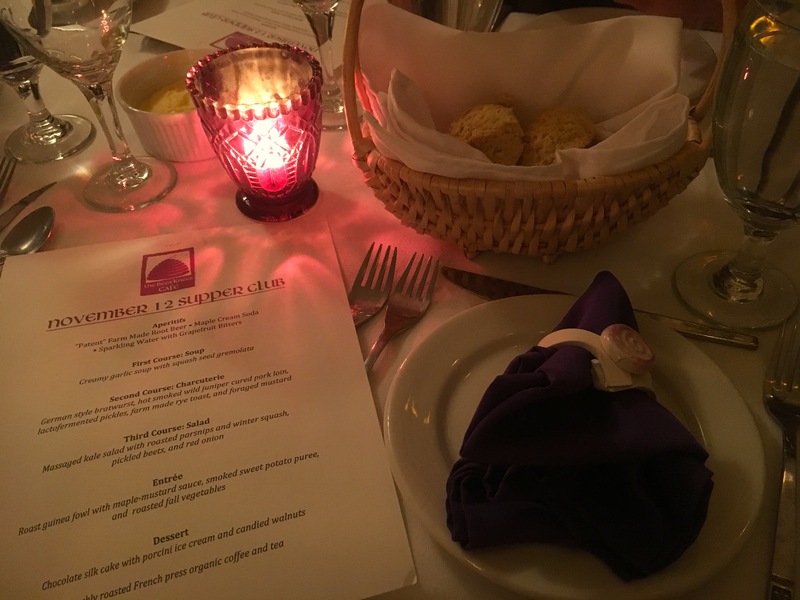 This entry was posted in Food and tagged Catskills, Catskills Foodie, Food Blogger, Upstate Farms, Upstate Foodie, Upstate New York on June 6, 2018 by JNUrbanski. 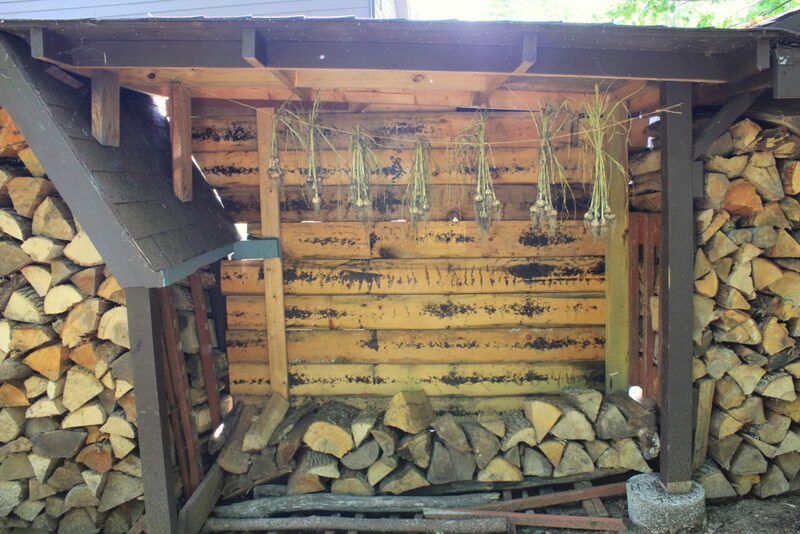 Garlic goes in about a month before the first frost of the season. One clove, planted two inches deep (with four inches between cloves) will grow into one bulb of garlic by next spring. The garlic pictured above is German hard neck garlic and the cloves are huge and juicy. The reason farmed garlic is so much bigger than wild garlic is that every year the largest cloves are planted, yielding bigger and bigger produce. Go to our Instagram feed to see footage of the planting. This entry was posted in Farming and tagged Catskills Farming, Catskills NY, Eat Local, Farm to Table, Garlic Planting, Upstate, Upstate Farms, Upstate NY on October 8, 2017 by JNUrbanski. This entry was posted in Farming and tagged Catskill Mountains, Catskills NY, Farm Life, Farming, Savings Seeds, Upstate Farms on September 15, 2017 by JNUrbanski. Now that the sun sets at 4.30pm and night falls before dinner, the journey to Saturday night eats becomes more romantic. Almost an hour spent on winding, country roads, through picturesque towns like Roxbury and Gilboa – site of one of the Catskills’ famous dams – to Preston Hollow is like winter film noir. Bright squares of light from homesteads and farmhouses flash by in the waning dusk and you catch fleeting glimpses of the toughest work days being put away. Farmers enjoying their own dinner at tables are spotted briefly through front windows. A farmer’s work is never done though and those farmers who have full-time jobs have to tend to animals through the night or help family members milk cows. This entry was posted in Food and tagged Catskill Foodie, Catskill Mountains, Catskills, Catskills Farms, Foodie, Upstate Farms, Upstate Life, Upstate Living on November 13, 2016 by JNUrbanski. 61F at 8.30am and overcast with overnight rain dripping from leaf and branch onto soggy forest floor. Breezy with rolling clouds and 73F at 3pm. 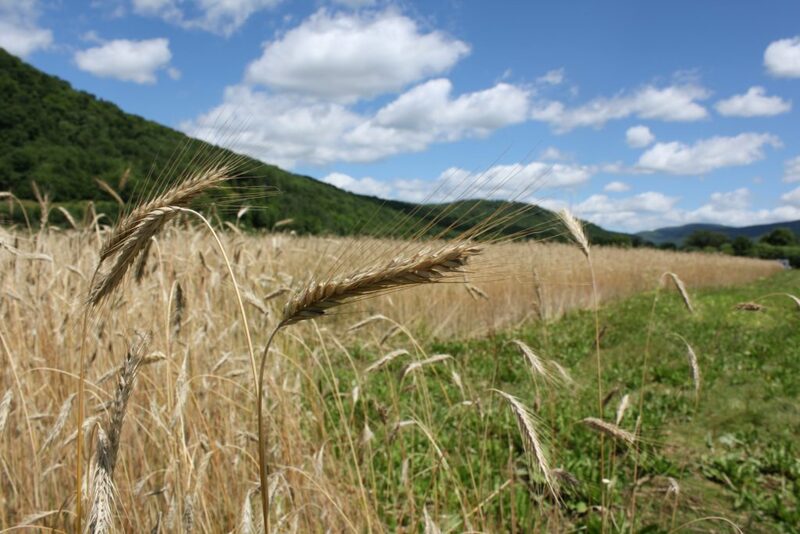 This entry was posted in Daily Catskills and tagged Catskill Mountains, Catskills, Catskills Farms, I love NY, New York Farms, Rye of New York, Upstate Farms, Upstate Life, Upstate Living, Upstate New York, Upstate NY on July 19, 2016 by JNUrbanski. 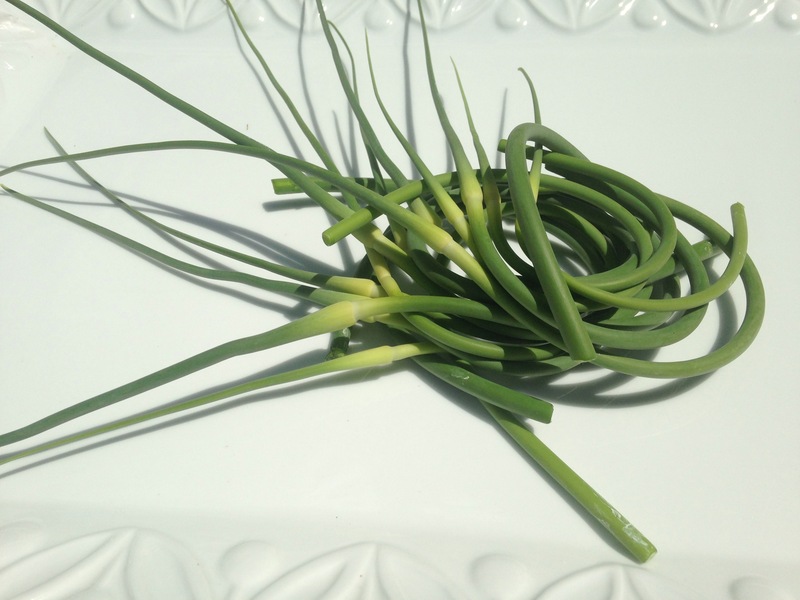 Garlic Scapes are the buds of the flower that garlic sends up in the spring. Farmers cut them off in order to encourage the plant to focus on the bulb. They have a much lighter, gentler garlic taste than bulb garlic and ever so slightly sweet. Delicious in omelettes, scrambled eggs, stir-fry dishes and roasted garlic potatoes, but they can get lost in soups unless you use a lot of them. They also make a superb pesto. Eaten raw, garlic provides those infamous, extraordinary health benefits. Blend all the ingredients except for the oil in a blender. Mix in the oil when the other ingredients are blended well. If your pesto is too thick, add a drizzle of extra oil. 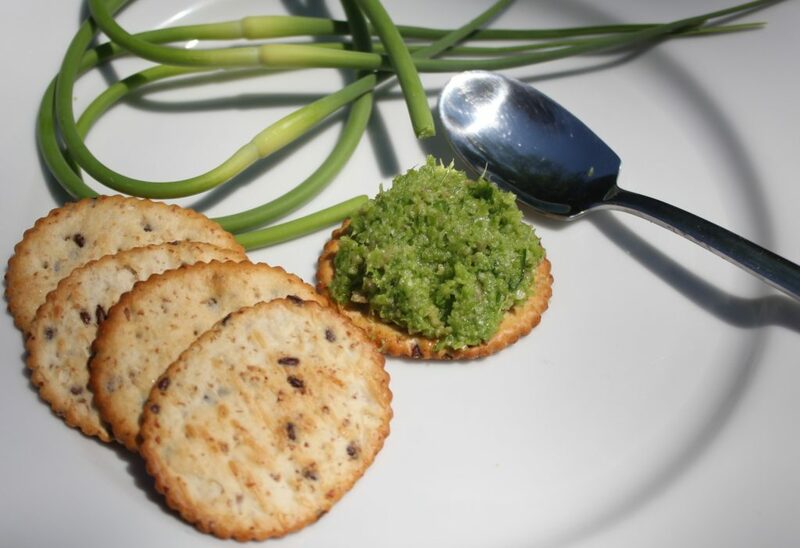 Serve on bruschetta, toast points, crackers. Or add a dollop to soups, pasta and cheese plates. Delicious! This entry was posted in Food and tagged Catskill Farming, Catskill Mountains, Catskills, Eat Locally Grown Food, Garlic Scapes, Homegrown, I love NY, Local Farms, Local Food, Upstate Farms, Upstate Life, Upstate Living, Upstate New York, Upstate NY on June 19, 2016 by JNUrbanski.